October is here, which for us means a month-long celebration of Halloween! 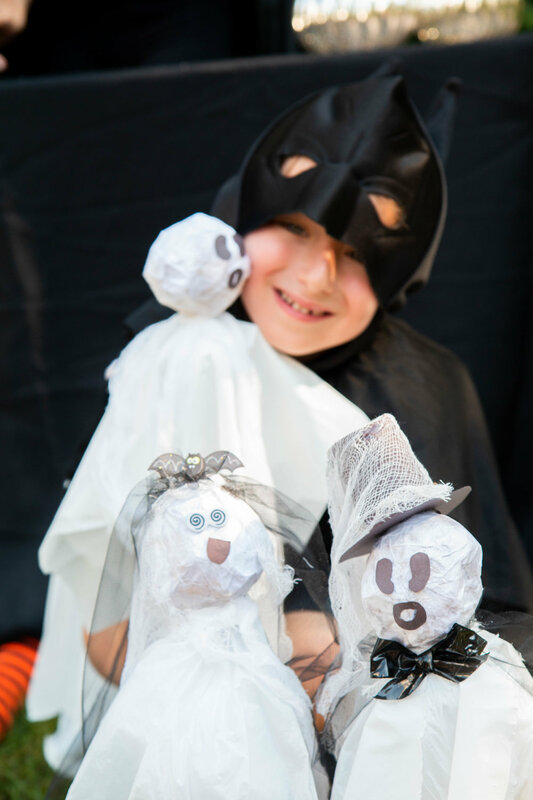 Goblins, ghosts, candy and costumes, we love it all. Seri’s crafty Aunt Marissa came to visit and made these amazing ghost decorations with Luke. 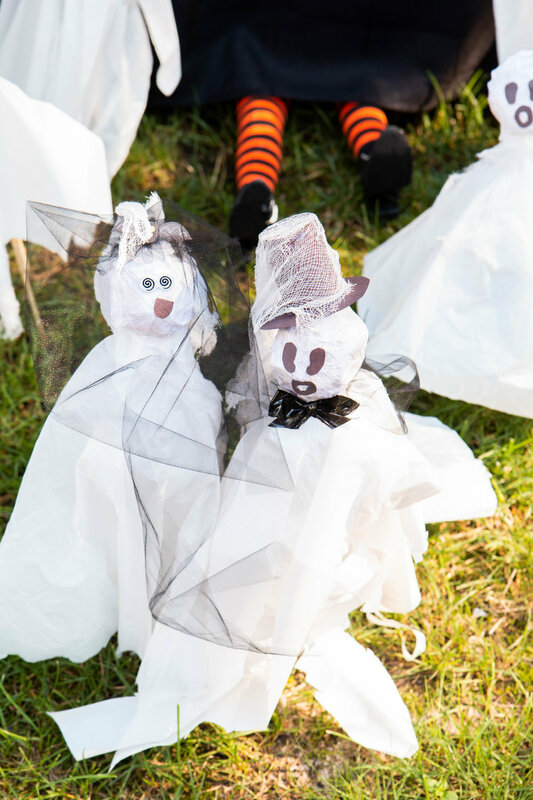 Not only are they perfect decor for any Halloween Party, they are such a fun activity to do with your little ones. Step 1: Make a hole in your paper ball and secure it to the wooden dowel using hot glue. Coat the ball with white glue using your brush. Step 2: Stick the tissue paper squares onto the wet glue, using your brush to smooth them down in layers. Step 3: Cut 1.5-2 inch wide strips from the plastic table cloth. Cut them in a variety of lengths. Use the hot glue to attach the long plastic strips to the top of the stick, right near the ball. Attach as many as you can around the stick. 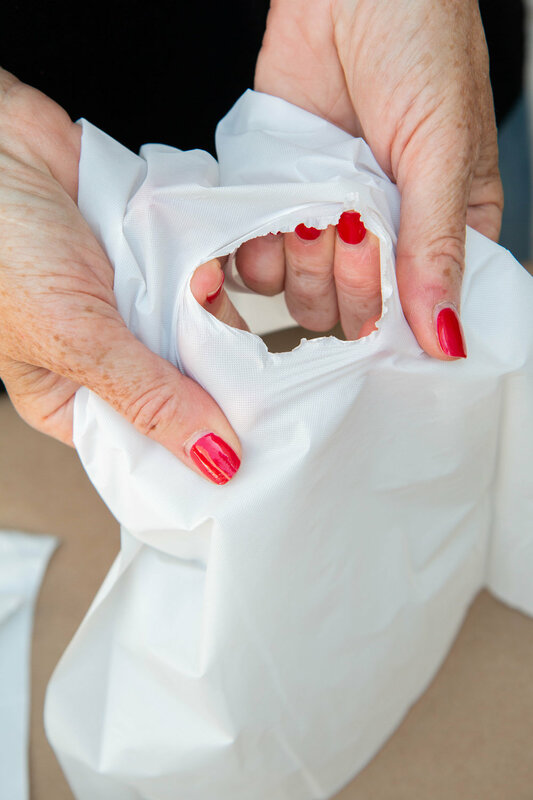 Step 4: Take another piece of the plastic tablecloth, about 14in by 14in, and pierce a hole through the middle. Pull it over the ball and pinch it around the stick, like a skirt, attaching with hot glue. Step 6: Attach your googly eyes and a “mouth” made of black construction paper using white glue. Step 7: Stick them into the grass on your front lawn. Imagine a whole lawn full!!!! 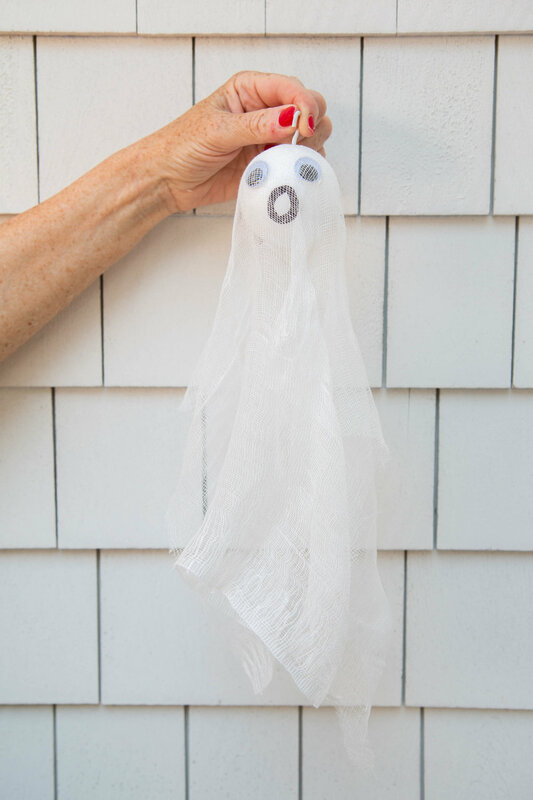 Make your ghost hang from the trees by using a styrofoam ball and a screw in hook! Step 1: Take a styrofoam ball, glue on googly eyes and a black construction paper mouth. 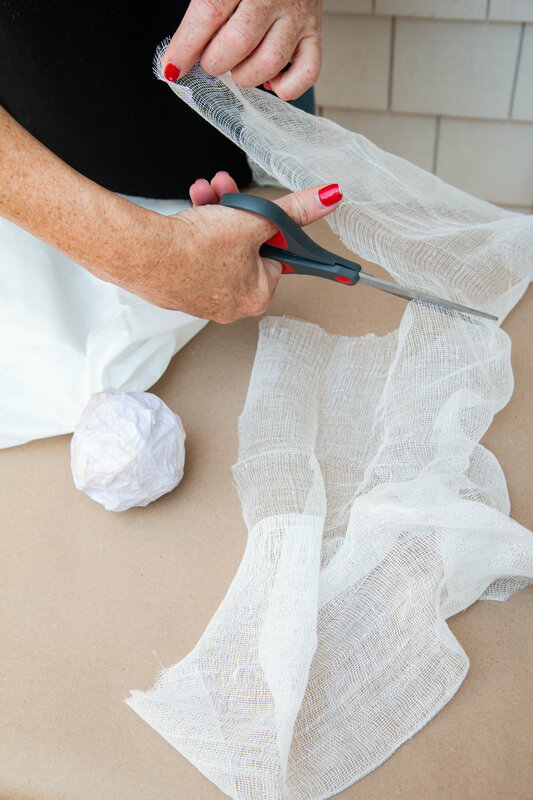 Step 2: Cut a square of gauze (cheesecloth) approximately 14 in x 14 in. 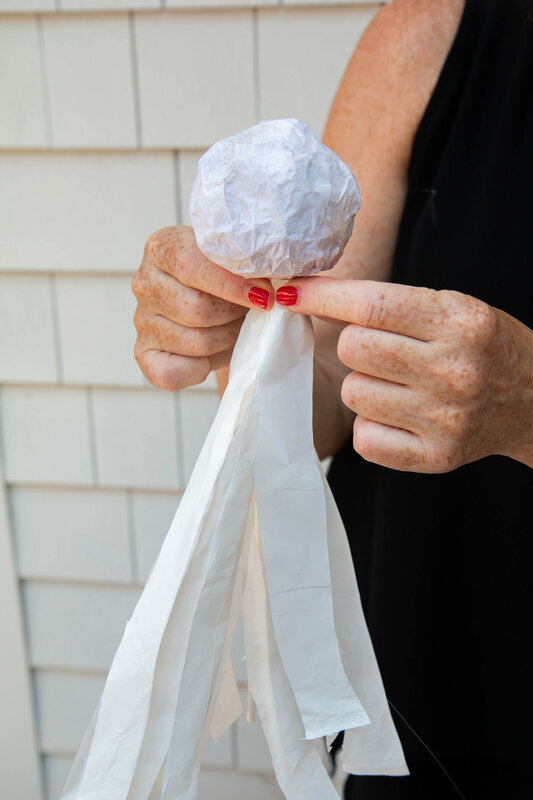 Step 3: Place the gauze over the styrofoam ball. Step 4: Put a dollop of glue at the top of the styrofoam ball. 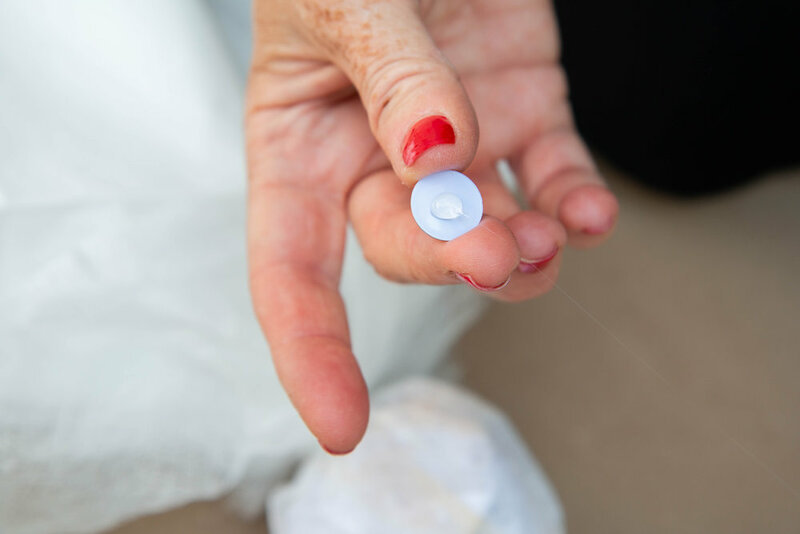 Step 5: Screw the cup hook into the styrofoam ball where the glue is. Step 6: Let the glue dry and hang your ghost on a tree where the wind can make it fly!